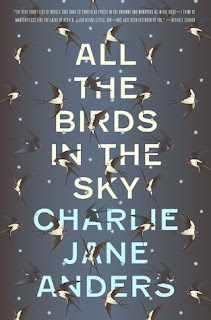 I wanted to like "All the Birds in the Sky" more than I did - but I still liked it well enough. There was so much hype around this book, maybe I was doomed to be disappointed (though "The Library at Mount Char" surpassed all its hype). Some of it was self-imposed, because I love Anders's short story "Six Months, Three Days." If you haven't read it, and like science-y fiction set in the present, definitely go check it out. "All the Birds in the Sky" is the story of Patricia and Laurence, two outcasts who became friends at a young age and go on to hold the fate of the world in their very different hands. Patricia is a witch, in touch with the natural world and the magic side of things. Laurence is into technology, builds a two-second time machine, and generally handles the science side of things. Both are massively misunderstood by their parents and peers at a young age, and this drives them together in childhood. Life goes on to separate them over time, but they encounter each other again in San Francisco. The novel covers both their childhood adventures and their adult encounters, culminating in their quests to save the world. At times these quests are in competition, at others they cooperate. Honestly, it's a bit hard to follow and even feels somewhat haphazard once it gets to that point in the novel. Had the book started with them as adults, I probably would have put it down. But the first chunk, with Patricia & Laurence as children gave me a solid grounding in them as characters & cultivated an interest in their relationship, such that I was invested enough to see it through. All this sounds like I didn't like the novel - I did. It was an enjoyable reading experience, but it hasn't stuck with me enough to make this a resounding recommendation. Verdict: Jury's out. If you're interested in something a bit different that blends science fiction & fantasy, check it out. Just beware it can feel a bit uneven. 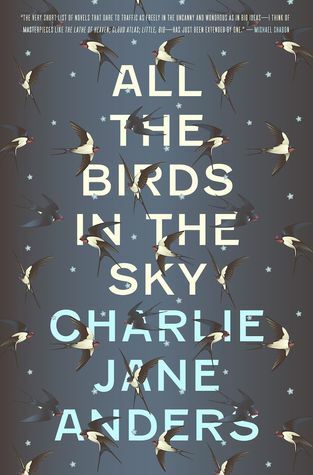 "All the Birds in the Sky" by Charlie Jane Anders, published January 26, 2016 by Tor Books.